Is plastic still good? After the introduction of the aluminium MacBook (Pro) laptops, the white MacBook made from polycarbonate hasn't got much attention. The low-price entry-level model from Apple is in no way a discontinued product, as it has already been updated twice this year. Thanks to the 9400M chipset graphics and the 2.13 GHz Core 2 Duo CPU it actually doesn't have to hide from the smallest MacBook Pro.How it performed in our extensive tests, you can find out in this review. Keep your eye firmly fixed on the picture to the right and it's difficult not to fall for the MacBook Pro 13. Stripped of the glossy, attention-seeking clothes of the average laptop, its body is hewn from a single chunk of aluminium, with just the black of the keyboard and display bezel to contrast against it. If you want a sturdy, attractive, powerful and versatile laptop with the stamina to travel, Apple's latest is a superb choice. Go back a page to see how the new 13-and 15-inch MacBook Pros shape up, and how they compare to this model in our benchmarking tests. Despite the 13-inch unibody model joining the MacBook Pro range, Apple has no intention of abandoning this polycarbonate MacBook. Apple assures us it's popular as an entrylevel machine, and will remain part of its product range for a long time. 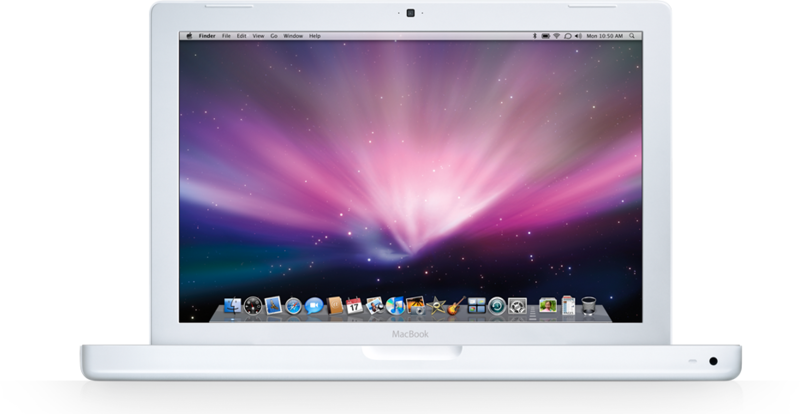 With Apple's unibody MacBook Pro stealing the limelight it's sometimes easy to forget that the white MacBook, which first went on sale way back in 2006, is still around. Aside from a rather stingy hard drive, this is a decent laptop. However, it's hamstrung by its need to not be 'too cheap' and a chassis that's known to be less than sturdy. If it was retailing around the £650 to £700 mark it would be a very serious contender, but as things stand there are lots of avenues we'd investigate before opting for the MacBook. Depending on your specific needs, for around £750, you're getting a real bargain with the last Apple MacBook. You can either approach the purchase as 'for £150 more I can get a MacBook Pro' or 'I can get something nearly as good as a MacBook Pro and save £150'. The latter perspective, however, requires you to be willing to skip some of the Pro-level features. If price plays a greater role in a shopper's buying decisions during tough economic times, Apple's recent updates to its entry-level laptop, the white, £749 MacBook, should help push some cost-conscious consumers over the laptop-buying fence. If you're in the market for an affordable Mac laptop, the white MacBook is a better bargain than ever. With its impressive performance, battery life, the inclusion of FireWire, and more common mini-DVI connector, the only reason to pay more for the low-end aluminum is the updated unibody design. 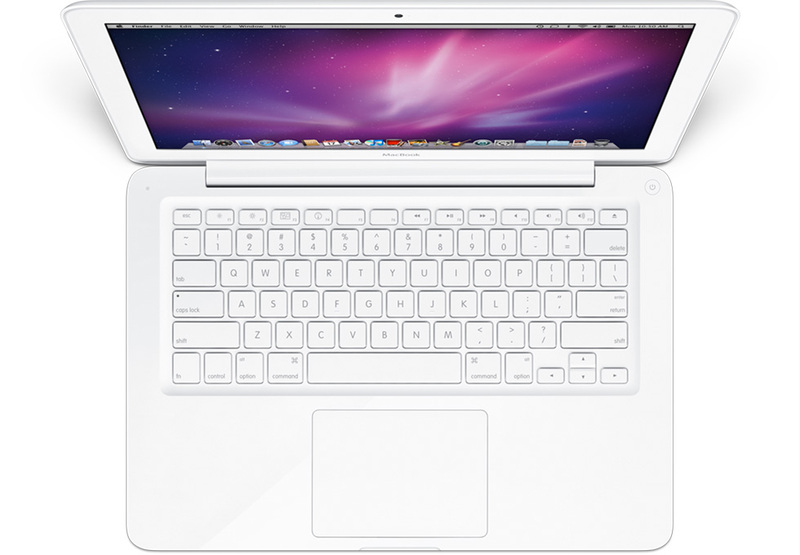 The MacBook white doesn't have the wow factor of the aluminium unibody MacBook models. As an entry point for Apple's notebook line it is relatively well specced against some PC rivals, but does come in at a price that might draw you back to the Windows family. Whilst it looks like good value against the Pro, it also highlights just how expensive the step-up model is. Ever since Apple unleashed the stunning aluminium unibody MacBooks in 2008, its original MacBook looked a forlorn, awkward proposition - an impression confirmed when we reviewed it back in July. Thankfully Apple finally rectified the situation in releasing the now unibodied, polycarbonate MacBook. If you really can’t afford the 13in MacBook Pro, the rehabilitated MacBook is an excellent alternative. Given the choice, however, we'd still recommend the Pro since its benefits outweigh the meagre price difference. The MacBook is the best-selling Mac model in Apple's history. So it makes a lot of sense that Apple has given its entry-level white laptop a considered makeover. While we lament the loss of a high-speed FireWire port, the new multi-touch trackpad, case design and faster components should more than compensate for most users. Cheaper 13in notebooks can be found but none will match the thoughtful design and sheer usability of this revised MacBook. Apple's entry-level MacBook improves on its predecessor by offering an upgraded, LED-backlit display, a unibody enclosure and a glass, multitouch trackpad. The glossy display is inferior to the screen on the MacBook Pro model of the same size, and the lack of FireWire and cramped USB ports will pose problems for some users. However, given its price point, the new MacBook comes recommended. Still, the MacBook does have one thing over most of its rivals: it will run Mac OS X. If that's what you want, this is the cheapest way to do so, and for light domestic use it will probably do so perfectly satisfactorily. Compare it to Windows-based laptops in the same price range, though, and it's clearly below par in several areas. Enhancements trickle down from the MacBook Pro, but two established features disappear. This new release of Apple's polycarbonate notebook, the ubiquitous MacBook 13.3inch sees several features from the Pro range trickle down to the entry-level model. 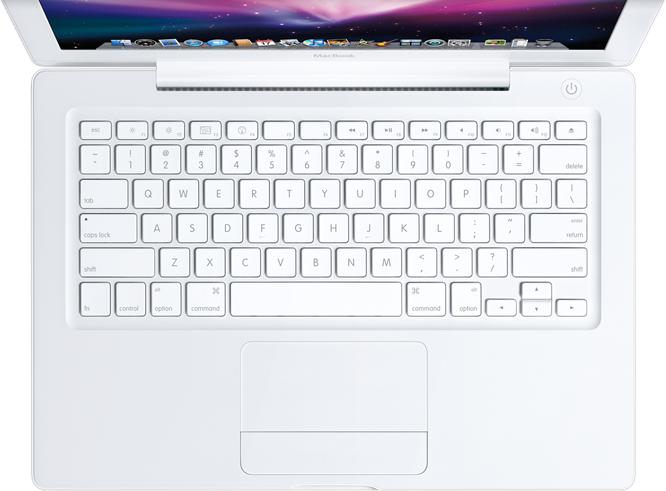 Overall, the late 2009 model represents an exciting and welcome upgrade for the MacBook. Gripes aside, Apple's entry-level notebook is moving in the right direction. Recession or no recession, Apple’s on a roll at the moment, with several new product announcements already this year. Our main complaint is that Apple has again slipped in a sneaky price increase, raising the price from £749 to £799. There are certainly cheaper laptops available, but the sleek redesign and improved battery life, along with the excellent supplied software, make the new Macbook an excellent choice for beginners and advanced users alike. All hail the unibody. After the well-received launch of its new MacBook Pros last year, which substituted many interlocking pieces for a single, one-piece chassis, Apple has carried over the unibody approach to the cheaper, $999 MacBook. The aluminum gives way to boring white plastic, but specs and design remain remarkably similar. Apple's revamped unibody MacBook which we review, gets the same 13-inch LED-backlit screen, multi-touch trackpad and unibody chassis as its. Apple has given its entry level laptop a spruce up. We take a look at the enhancements in this review. length Apple's new unibody polycarbonate construction brings a near, but not quite, premium feel to the MacBook, which is most definitely needed. The only real issue is that it's not much cheaper than the even better starter MacBook Pro. Overall, the new release of the MacBook is a win for Apple. It may cost an extra £50 but, it features a better screen, faster processor, bigger hard drive and a more rigid, robust design. If only it hadn’t lost the infrared and FireWire ports, but these minor gripes may dissapear soon if we keep our fingers crossed. The white polycarbonate MacBook has a place in many Mac lovers’ hearts and Apple is clearly keen to keep its distinctive design as a way to distinguish this entry-level laptop from its MacBook Pro range. So, while all-aluminium cases are now the order of the day for all other Apple computers, this new late’ 2009’ MacBook is still made from plastic. It’s missing a couple of features for a £799 laptop, but the MacBook Pro is still excellent value — and an excellent entry-level Apple laptop. The creeping price increases mean that the new MacBook doesn’t offer quite the same value for money as earlier models, yet its continued success is testament to the sheer quality of Apple’s design work. There are plenty of cheaper PC notebooks and netbooks available, but the design and build quality of the MacBook still make it stand out from the crowd. Thankfully, though, there’s more to the MacBook than just its good looks, and the improved screen quality, performance and battery life make this a really solid little workhorse of a laptop that will earn its keep – despite the price hike. The new $999 Unibody Macbook from Apple, which launched October 20th, has been out long enough for reviewers to pass judgment on the new curved white exterior and beefed up internals. Overall, the new design, additional power and glass trackpad have impressed reviewers; though many note that it is prone to scratches and close enough in price that the Macbook Pro may be worth the upgrade. Apple hasn't messed too much with the white plastic MacBook for this late 2009 refresh, but it has spruced up its entry-level laptop to bring it into line with its MacBook Pro models. The most obvious change is the move to a unibody enclosure, but this is cast from a single slab of slick polycarbonate rather than the aluminium ingot of the MacBook Pro. Although the MacBook is missing a couple of features that should be standard at this price, it's still a highly capable laptop at an entry-level (for Apple) price. Apple hasn't messed too much with the white plastic MacBook for this late 2009 refresh, but it has spruced up its entry-level laptop to bring it into line with its MacBook Pro models. Although the MacBook is missing a couple of features that should be standard at this price, it's still a highly capable laptop at an entry-level (for Apple) price. In a field of overwhelming laptop sameness, Apple’s MacBook has long been destined to become an enduring style icon. But, with the birth of the aluminium framed MacBook Pro range, the creaky, old plastic MacBook was shown up somewhat – what it needed was reconstructive surgery of its own. Right on cue, meet the new MacBook, now with modern styling. A design improvement and a decent specification, but we still prefer its Pro cousin. The MacBook is an extremely competent, utterly boring laptop that doesn't have enough ports. If you're desperate for a new Mac and you've only got a grand, it'll do you fine, and the unibody upgrade and nicer screen are certainly welcome -- plastic laptops simply don't come any more solidly built than this. If it were up to us, however, we'd stay home on Saturday nights until we'd stashed enough coin for the $1,199 13-inch MacBook Pro -- not only for the added SD card slot and FireWire port, but also for the brighter, better display and aluminum case that doesn't scratch, dent, and discolor at the slightest provocation. There's just no reason to skimp and get the MacBook if you can manage to get the Pro. While it's neither the less-expensive entry-level MacBook some had hoped for, nor the long-rumored touch-screen device, the new 13-inch MacBook can now escape its designation as the lone holdover system from Apple's previous generation, thanks to an upscale makeover that keeps the price stable at just under the $1,000 mark. Apple's latest version of the popular $999 white MacBook gets an upscale makeover, while keeping the price the same. It's a strong alternative to the more expensive Pro line, if you can live without extras such as an SD card slot. White polycarbonate plastic looked as if its days were numbered after the Apple MacBook Pro 13-inch emerged with a metallic Unibody enclosure, keeping with the look of the MacBook Air and MacBook Pro. Yet, Apple continued to update the plastic MacBook with new parts under the radar. Like all the white MacBooks before it, the Apple MacBook (Unibody) will continue to drive sales because it's the least expensive among its brethren. If you’re weighing the new MacBook or the entry-level 13-inch MacBook Pro, unless you require high color accuracy (in which case you’re likely using a larger, external display) right now we’d plump for the MacBook. Apple will inevitably roll out an updated Pro range reasonably early into 2010, but as it stands you’re getting pretty much the same key specifications in the MacBook, only for $200 less. That’s a fair chunk of money, and while you don’t get the SD card reader or the FireWire port, you do get a larger hard-drive. We take a first look at the updated MacBook, as well as the refreshed iMac, the new Mini server, and the Magic Mouse. Apple no doubt timed the release of its new hardware to spoil some of Microsoft's Windows 7 thunder and it has clearly worked, and I for one, am writing this about Apple, and not as I probably otherwise would be, about Windows 7. Aside from the price increase on the MacBook, there's plenty to like about the Apple's latest hardware refresh. Apple’s elegantly redesigned MacBook offers strong performance, excellent ergononics, and good battery life for a reasonable price. Thanks to its stellar industrial design, superior ergonomics, and above-average performance and battery life, 13-inch MacBook ($999) is a compelling buy. This notebook costs nearly the same as Windows-based competitors (like Dell Studio XPS 13) but offers longer endurance. The main question for consumers is whether they spend the extra $200 on the 13-inch MacBook Pro, which has an SD Card slot, backlit keyboard, and a sleeker aluminum chassis. If you can live without these amenities, the new MacBook is a strong choice. 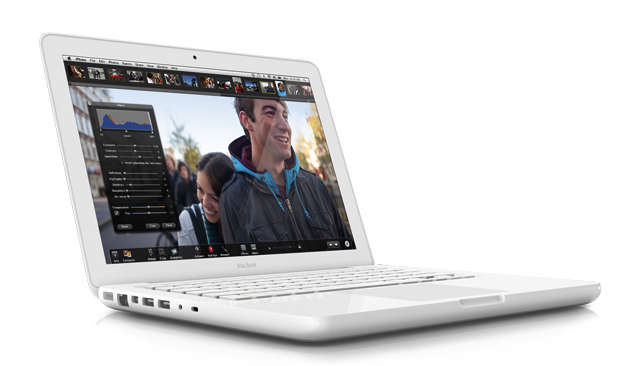 Since its introduction back in May 2006, Apple's low-cost, entry-level MacBook laptop has been tremendously popular. In fact, Apple says the MacBook is the best-selling single Mac model in the company's history. Which is why it makes a lot of sense that Apple has given its £799 white laptop a makeover in time for the Christmas shopping season. The new Apple MacBook looks great in its new unibody design, although the lack of user-replaceable battery will annoy some. At £799 it's no cheap netbook - and that's a good thing, as this entry-level Mac laptop is fully powered. Despite what Windows users may believe, not all Mac users are millionaires with money to burn. For all the students, starving artists, and underemployed creative types in the Mac universe, the MacBook is the most important laptop model in Apple's lineup. With an LED-backlit display and a glass touch pad, the $999 MacBook feels a bit like its MacBook Pro big sibling, but weigh its trade-offs carefully. The white MacBook was starting to look a little long in the tooth next to the aluminium MacBook Pros that were first launched late last year, but now Apple has given its plastic entry-level laptop a small spec bump and a 'unibody' makeover. It's available now for £799 direct from Apple. It's stingy of Apple omit FireWire and an SD Card slot at this price, but if these are features you won't miss, the MacBook is otherwise a great-value entry-laptop Apple laptop. If they are, you can always find them on the £899 MacBook Pro. At the end of last year, Apple updated its Macbook range of laptops, giving them a shiny new aluminium design so they looked very similar to the company’s more expensive Macbook Pro models. The improved performance and battery life are welcome improvements, and although the cost cut may seem relatively modest we suspect that the new £899 price will be attractive enough to ensure that the new 13in Macbook Pro is a greater success than its predecessor. The MacBook White is the least expensive notebook in Apple’s portable range and this fits with its positioning as an enticing proposition for students. 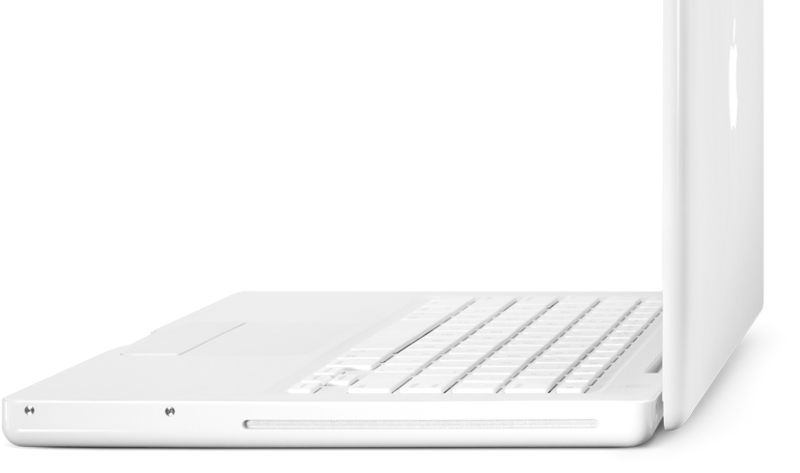 The White is also designed to draw existing Windows-based notebook users to the Apple bandwagon. Despite its entry-level positioning and bargain - for an Apple notebook – price tag, the White doesn’t come off as a budget machine. It features a white polycarbonate body and this looks fantastic from every angle. Although the White is the least expensive MacBook in Apple's arsenal you shouldn't underestimate it. Updated graphics. After its latest refresh the white MacBook has caught up again with the MacBook Pro 13. Its GeForce 320M provides markedly improved graphics performance, but does the package as a whole justify the relatively high price tag? NVIDIA GeForce 9400M (G) / ION (LE): Integrated (shared Memory) graphics adapter. 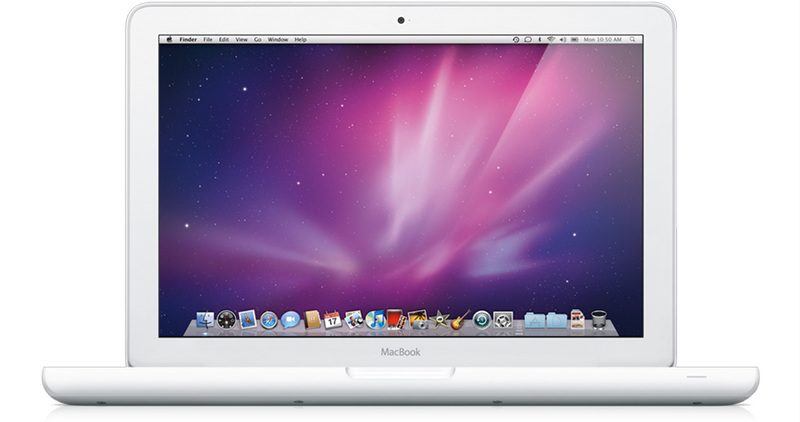 Built in in current MacBook, MacBook Pro, and MacBook Air laptops and also used in the ION (LE) platform for netbooks. Also called GeForce 9400M G. Fastest available motherboard GPU (in 2009). Integrated PureVideo HD (VP3) video processor to decode HD videos with the GPU.Non demanding games should be playable with these graphics cards. NVIDIA GeForce 320M: Integrated chipset graphics card based on the GT216 core (e.g. GeForce GT 325M) but without dedicated memory. Supports Core 2 Duo processors.» Further information can be found in our Comparison of Mobile Graphics Cards and the corresponding Benchmark List.